With an unrivalled location on the iconic seafront and just moments from the bustling Lanes, this Brighton Harbour Hotel & Spa is the hottest new destination in buzzy Brighton. 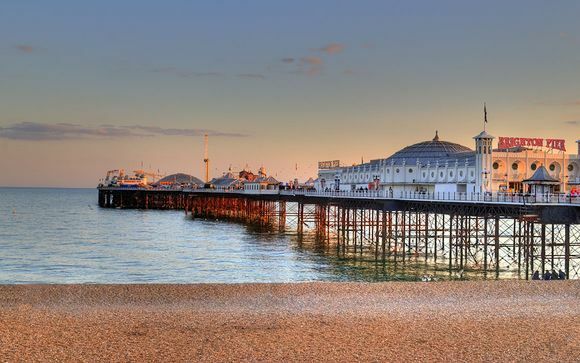 The bohemian city of Brighton is an ever-popular choice for a weekend break. With the British Airways i360 now open, the seaside resort continues to cement its place as one of the UK’s most exciting staycation destinations making the Brighton Harbour Hotel a chic haven, ideal for those seeking a base to explore the thriving coastal city – stroll along the vibrant pier or meander the famous Lanes, before returning to the hotel to sip champagne at sunset. The 79 bedroom hotel embodies Harbour Hotels’ signature relaxed style, with tasteful interiors providing a modern contrast to the exquisite 19th century period exterior. 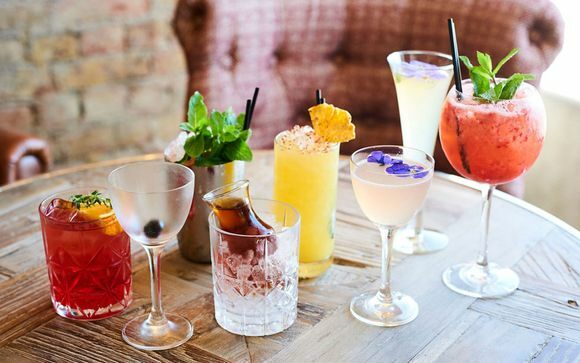 With panoramic views across Brighton Pier, dine in the award-winning Jetty Restaurant and enjoy inspired and innovative cocktails in ‘HarBAR’, Brighton’s ultimate destination bar. The Harbour Spa will provide a welcome retreat from the sights, sounds and shops of the city with the launch of its fabulous spa facilities. 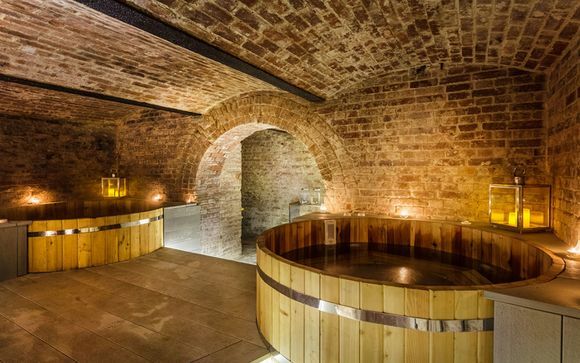 The unique, underground spa will feature indulgent treatment rooms, sauna, steam room, Scandinavian hot tubs and hydrotherapy pool, as well as Brighton’s very first rooftop infinity pool, to provide the ultimate relaxation retreat. If the lure is the sea, then the Harbour Hotel is pretty much ideal. A member of the southern-based Harbour Hotels collection, this 79-bedroom property has opted for an attractive contemporary seasidey décor. Inside, playful marine images complement colour schemes of soft blues, pinks, pale orange and dove grey – and the overall bright boutique look is carried through into its spacious restaurant and cocktail bar. This offer is based on a Sea View Room. 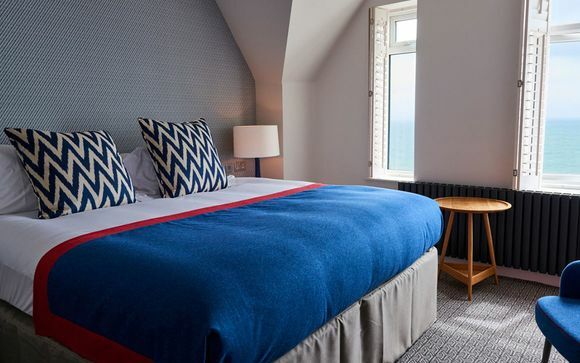 With 79 luxury linen bedrooms, many boasting spectacular views across the Brighton’s iconic seafront, you will feel instantly relaxed as you settle into your coastal surroundings. All bedrooms feature the little touches you would expect from luxury accommodation – from sumptuous duvets, Oxford pillows and Egyptian cotton sheets to complimentary decanters of Gin and Sherry in every room. Your lovely sea view room allows you to wake up to beautiful vistas and features an en-suite bathroom with walk in shower, alongside a flat-screen TV, complimentary wi-fi, safe, hairdryer and White Company toiletries! 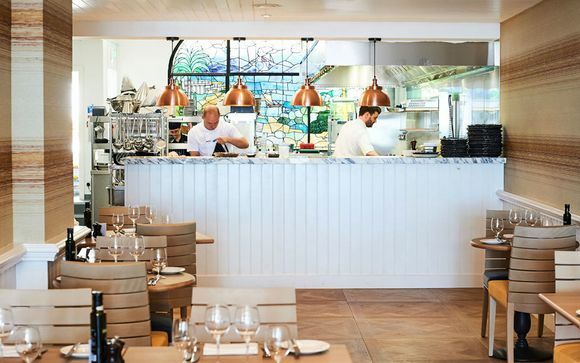 The multi award-winning Jetty Restaurant concept has landed in Brighton. 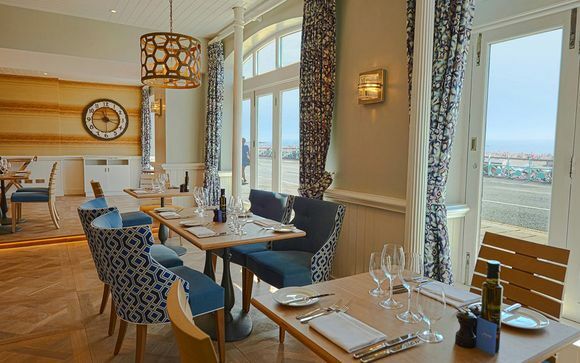 Following on from the success of The Jetty restaurants in Christchurch, Dorset and Salcombe, Devon, The Jetty Restaurant in Brighton offers a lively yet relaxed atmosphere, alongside menus that are excellent yet approachable! With spectacular panoramic views across Brighton’s iconic seafront, The Jetty is a great place to gather with friends, open a bottle of wine and enjoy exceptional food in relaxed surroundings. Featuring tasteful banquette seating, sleek marble surfaces and bespoke lighting features, soak up the ambiance of our all day bar & grill. Showcasing locally sourced, seasonal ingredients and dishes, alongside an eclectic wine list and inspired cocktail menu, the restaurant offers a unique dining experience on Brighton’s vibrant seafront. HarBAR, recently awarded Brighton’s ‘Best New Bar’ at the 2016 Brighton Bartender Awards, is Brighton’s ultimate destination bar with an inspired drinks menu alongside stylish décor and design. With sweeping views across the seafront, the bar features a stunning marble top bar, lined with plush stools and surrounded by relaxed furnishings. Just for you: 1 x 25 minute treatment per person per stay. Brighton Harbour Spa is located on Brighton’s popular seafront, providing a relaxing retreat in the heart of this lively city. Offering an extensive range of spa treatments along with everyday beauty needs, including facials, manicures, pedicures and massages. The spa therapists will carefully tailor each treatment to your individual preferences and skin requirements. If you’re not sure which is best for you, the expert therapists are on hand to recommend the perfect treatment. Please note that the treatment times specified include a consultation to ensure the treatment is tailored to your individual needs. Treatments must be booked prior to arrival. You can walk to the hotel in just under 15 minutes from Brighton Train Station and Gatwick Airport is 27 miles away by car. For the nearest car park please visit NCP’s website. The hotel recommend Russell Road as the best value of the local car parks.